All hail Chef Lili Sullivan of Gazebo Restaurant at Waupoos Estate Winery! 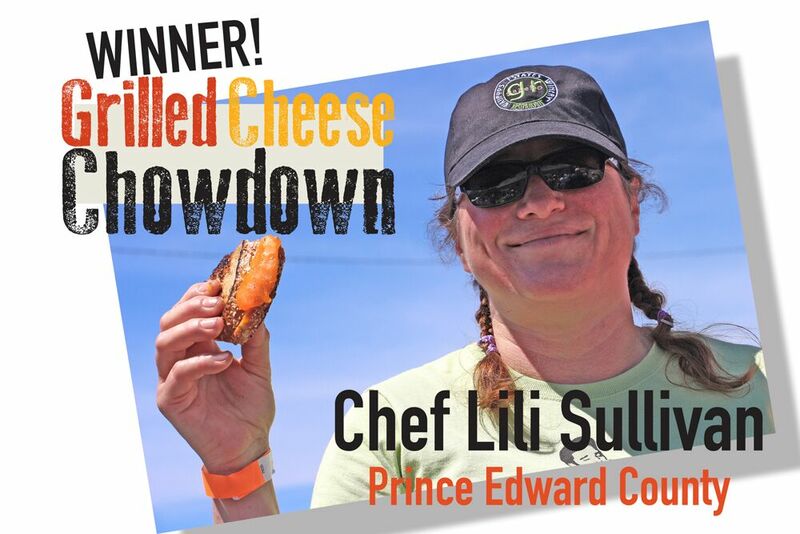 Chef Lili Sullivan showed three chefs of the male persuasion how it’s done in the County when she easily defeated them in a grilled-cheese showdown at The Great Canadian Cheese Festival. Chef Sullivan, who runs Gazebo Restaurant at Waupoos Estates Winery in Prince Edward County, grilled 250 cheese sandwiches in 34 minutes flat—while the men were barely halfway. Total focus and fast hands not afraid of heat were her secret weapons. 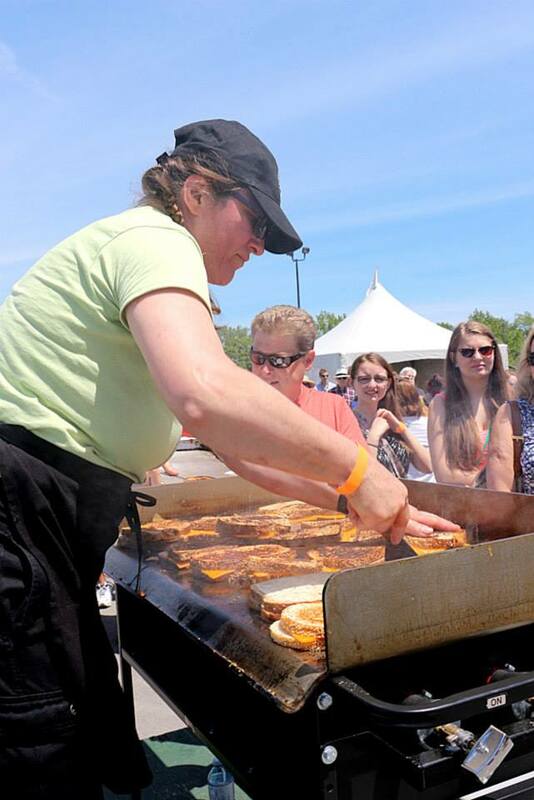 The competition—to see which of the four chefs could grill 250 cheese sandwiches the quickest—was the method Cheese Festival organizers concocted to feed the first 1,000 ticket holders admitted on Sunday, June 7, in a fifth-anniversary celebration called Grilled Cheese Chowdown. Total focus and fast hands not afraid of heat. Chef photos and graphic by Jane Churchill. Chef Sullivan grilled her sammies with Black River Cheese cheddar, Stonemill Bakehouse Prince Edward County Rye and Stirling Creamery unsalted butter. Her prize? A cheque for $1,000 paid on her behalf by the Cheese Festival to the charity of her choice, Prince Edward County Memorial Hospital Auxiliary. Click here for a Grilled Cheese Chowdown photo album. While grilled cheese does not make an appearance on the menu at Gazebo Restaurant in Waupoos, Chef Sullivan certainly brought her A-game to the competition. After studying culinary management at George Brown College, Sullivan went on to Toronto’s Auberge du Pommier, later taking the lead as head chef at Chapeau Bistro and The Rebel House. As an advocate of the slow food movement in Ontario, she spent nine years on the board of directors of Organic Advocates’ Feast of Fields. The organization, which was co-founded by Chef Jamie Kennedy, brings chefs and farmers together to raise awareness of organic eating and its benefits to the environment and to humans. As the movement took hold in bucolic Prince Edward County, the wine region’s magnetism was evident. A long-time supporter of Countylicious, Sullivan’s cooking draws crowds during the County’s twice annual prix-fixe celebration of local food. 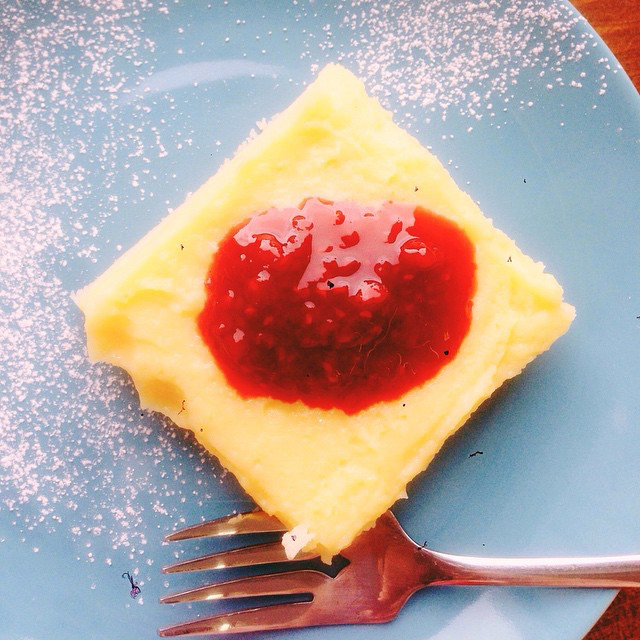 Countylicious’ goal is to introduce diners to the bounty of local food that’s still available during the “shoulder seasons” of fall and spring, when most farmer’s markets have wound down for the year or have yet to open up. 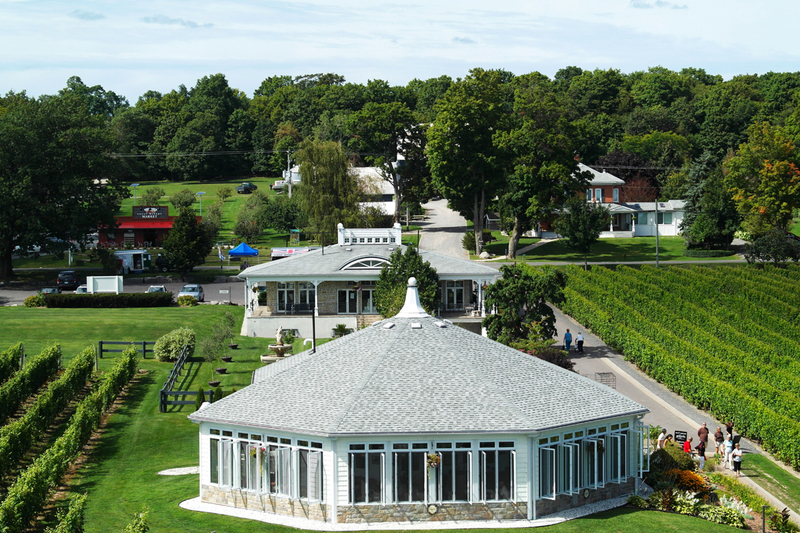 Gazebo Restaurant at Waupoos Estates Winery in Prince Edward County. “Locally grown is not a trend, but a lifestyle,” quips Sullivan. A truly seasonal eater, her family relocated from Europe in the 1960s, bringing their culinary sensibilities with them. “We only ate strawberries when they were in season. It’s just the way I was raised,” said Sullivan, in a Bay of Quinte Tourism Local Food episode last year. The Grilled Cheese Chowdown was the perfect venue for Sullivan to showcase local tastes, with all cheese provided by the Cheddar & Ale Trail producers of Hastings and Prince Edward counties. The next Great Canadian Cheese Festival—the biggest artisan cheese show in Canada—takes place Saturday and Sunday, June 4 and 5, 2016, in Picton, Ontario, at the Fairgrounds. For complete information, visit CheeseFestival.ca. By night, Laura Voskamp is a cheese lover and freelance writer. By day, she’s Communications Coordinator for Bay of Quinte Tourism and Bay of Quinte Living. 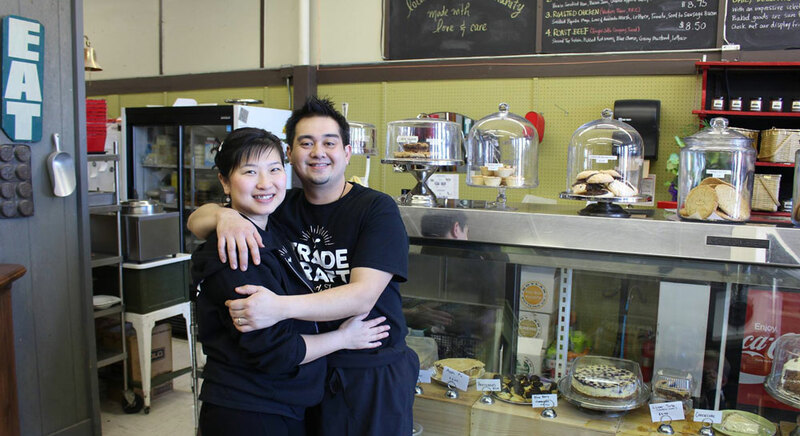 Jeff and Rayling Camacho, owners of Burger Revolution in Belleville and Trade Craft Good Food in nearby Brighton. Makers+Mongers in Cheeseburger Paradise on Saturday evening at The Great Canadian Cheese Festival will introduce you to a cozy little burger joint in Belleville, Ontario, one that’s grown to include a second, sammy-driven location in nearby Brighton, and a huge community following. If you’ve been searching for a perfectly executed grilled cheese, or a succulent handmade burger, you’ll find everything you’re looking for and more at Burger Revolution and Trade Craft Good Food Co.
Burger Revolution began its uprising in 2012. In the shadows of a Burger King no less, Jeff and Rayling Camacho launched their tongue-in-cheek response to the fast-food trend: a slow-food outpost focusing on quality, local ingredients, and of course, appropriately rebellious naming conventions. With menu items like the “Chevre Guevara” and the “Malcolm X-treme,” Burger Rev has cemented itself in the hearts of foodies and revolutionaries alike. 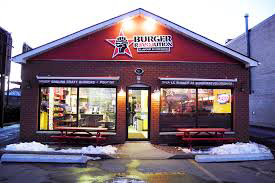 Burger Revolution at 300 North Front Street, Belleville. 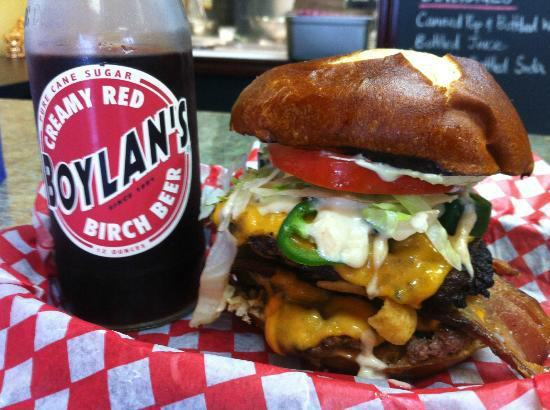 “We wanted to give people a reason to keep coming back regularly,” says Jeff, “We didn’t want it to be a special occasion, fine dining establishment, but instead, somewhere that we’d see people more often.” Each month, a limited-edition burger is added to the restaurant’s roster, and a social media frenzy ensues as Jeff and Rayling ask their Facebook fans to name their new creation. Past hits have included pork belly and Sriracha maple “Aporkalypse Now,” and a crispy fish creation dubbed “The Kraken.” The business itself began with an outcry from burger lovers, and led to the creation of the Burger Revolution manifesto: Give The People What They Want; Give The People Flavour! Pastry madfe in-house at Trade Craft in Brighton. The philosophy extended earlier this year to include Trade Craft Good Food Co: Jeff and Rayling’s new sandwich shop nestled into the End of the Thread Antique Emporium in Brighton, Ontario. “We had been talking about food trucks,” says Jeff, “but every time we think we might go that direction, a different business is the result.” The 475 ’wich, stuffed with ham and Granny Smith apples, is further testament to the operation’s local-flair, and is just a taste of what you can expect when you walk through its retro-inspired café surroundings. When it comes to Trade Craft, sandwich meats are also sourced from Enright (Don’t miss the pastrami when you make the trip!) and are cured and smoked in-house. Bread and pastries are baked fresh daily, and the shop has even begun crafting its own line of hot sauces and condiments so that you can take home the shop’s special flavours. Flavor and tastiness, hallmarks of a signature cheeseburger created by Jeff Camacho. What to expect from the masterminds behind Trade Craft and Burger Rev at Makers+Mongers? In a word, or two, flavor and tastiness. For his cheeseburgers, Jeff will be using Enright Cattle Co. beef, award-winning Raclette cheese made by Fromagerie Fritz Kaiser, kaiser buns by Stonemill Bakehouse, and condiments made in-house. Also on the menu, appetizers provided by artisan food exhibitors in the Cheese Festival, superb sausage by Seed to Sausage, several sides created by Chef Michael Hoy, and incredible desserts made by Pastry Master Peter Grendel. Oh yes, Vineland Estates Winery and Beau’s All Natural Brewing at the cash bar. The fifth anniversary of The Great Canadian Cheese Festival—the biggest artisan cheese show in Canada—takes place Saturday and Sunday, June 6 and 7, in Picton, Ontario, at the Fairgrounds. For complete information and tickets, please visit CheeseFestival.ca.